Wat Mahapruettharam (ma-ha-pruet-tha-ram) is an old temple and there are no records as to when it was actually built. 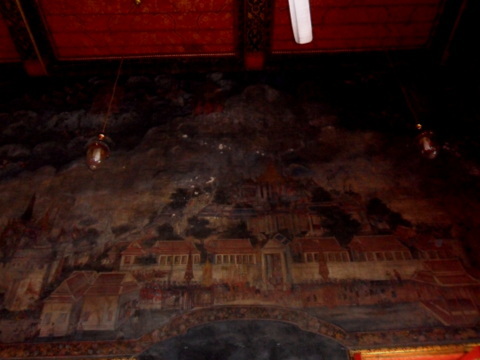 The temple was rebuilt in the reign of King IV (1851 – 1868) and features beautiful murals in the ubosot and a 19 m reclining Buddha in the viharn. 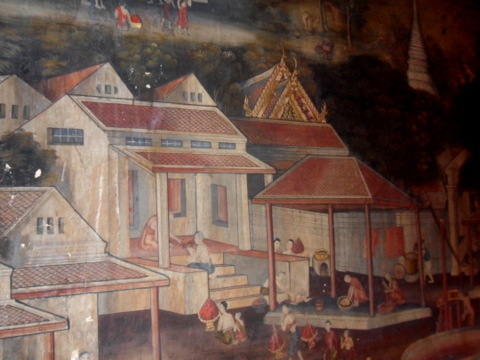 The temple was originally called Wat Tha Kwian as the area was a resting place for water buffalo carts (kwian). 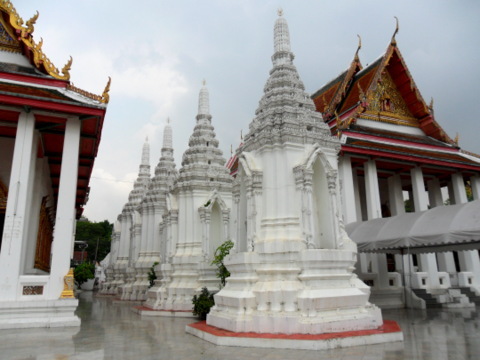 After the renovation by King Rama IV, the temple was given its current name and acquired the status of a third class royal temple. 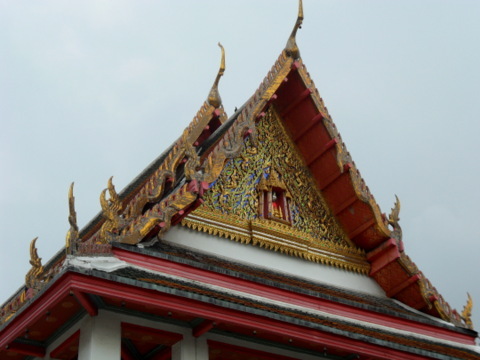 There are two categories of temples in Thailand; royal temples and common temples. Royal temples are constructed or renovated by royalty, constructed by nobility or wealthy persons and dedicated to the king. Common temples are built with funds donated by the people, usually the community living around the temple and others who worship at the temple. 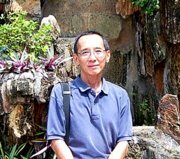 There are three classes of royal temples and each class is further divided into grades. Suffixes attached to the name of the temple indicate the grade of the temple. 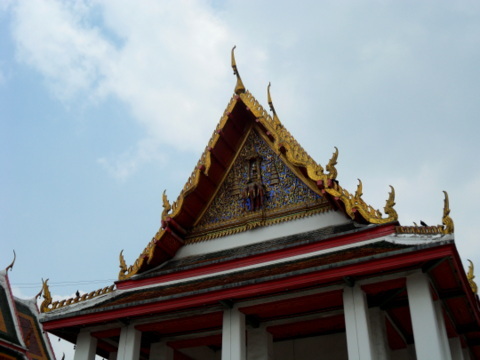 For example Wat Mahapruettharam is a third class temple of the Worawihan grade (second grade); hence the full name will be Wat Mahapruetttharam Worawihan. Here’s a brief orientation to the temple grounds to guide you through your tour of this temple. Enter the temple through the Mahapruettharam Road entrance where there is an archway. The buildings with the attractive features are within a walled enclosure. Proceed along the road to the north gate. The other gate that’s open on normal days is the east gate. Please see layout of the temple grounds. After entering the north gate you will see three rectangular buildings, one behind the other. 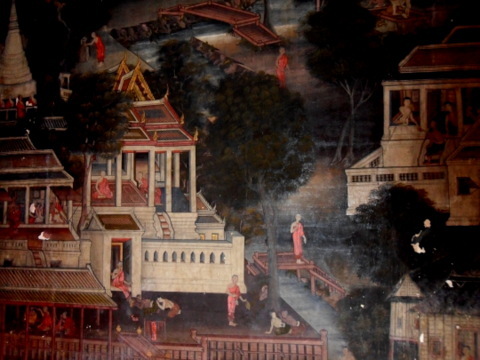 Between the ubosot and Viharn Luang Pho Sukhothai are four prang in a row. 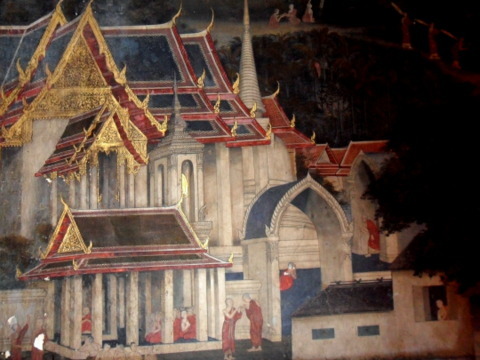 The ubosot or ordination hall is where new monks take their vows when they enter the monkhood. 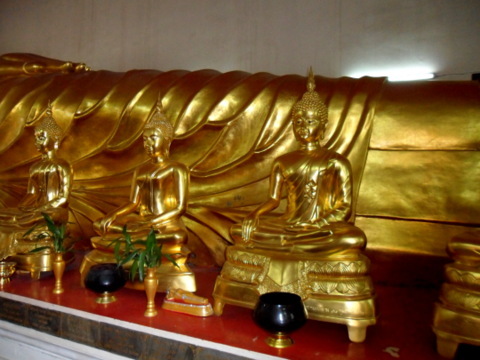 It’s the place where the principal Buddha image is displayed on an altar. 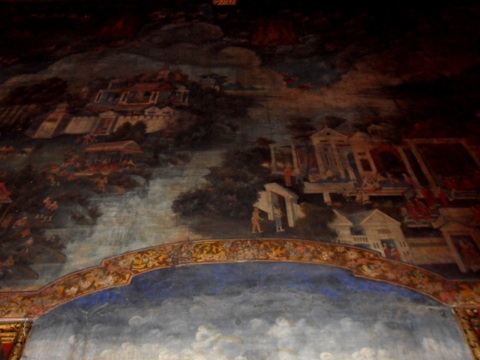 The walls of the ubosot are covered with beautiful murals from just above the floor right up to the ceiling. 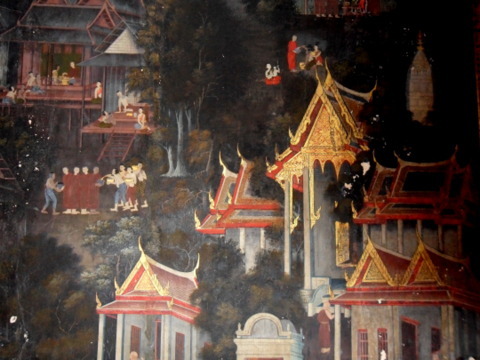 These murals depict the 13 ascetic practices of Buddhism. 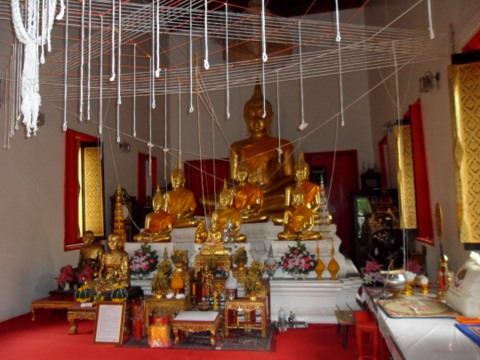 The viharn is another building with Buddha images where worshipers can meditate and pray. 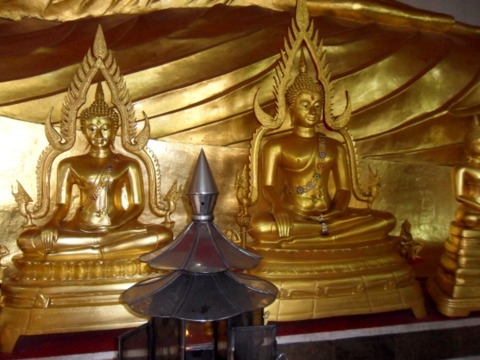 This viharn was named after a venerable monk (Luang Pho) and there are several Buddha images on the altar. 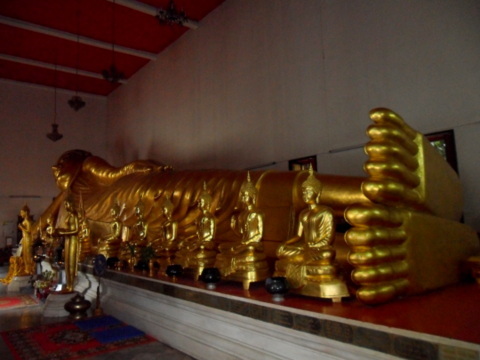 The other highlight of Wat Mahapruettharam is in the third building, the Viharn with a 19 m reclining Buddha in gold. 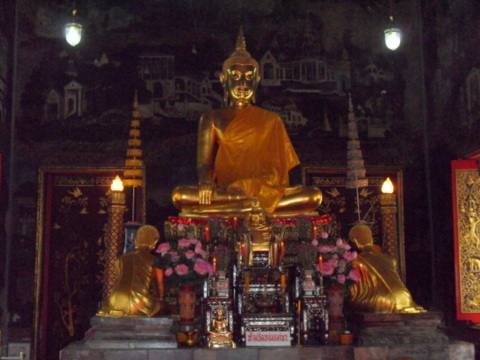 As a matter of interest, the reclining Buddha in Wat Pho is 46 m.
There are also several golden Buddha statues in the standing and sitting positions in this viharn. Please remove your footwear before entering these three buildings. 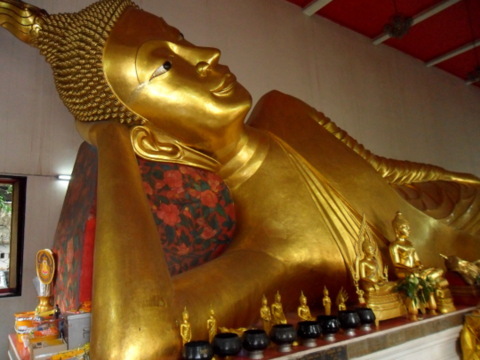 At the Viharn with the reclining Buddha, make a donation of 20 baht for entry. This is the only charge for the visit to this temple. Prang is a religious spire of Khmer origin with niches on the sides and elaborate carvings. 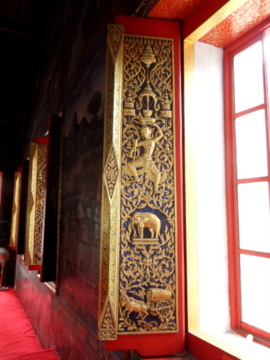 There are four prang within the wall enclosure. 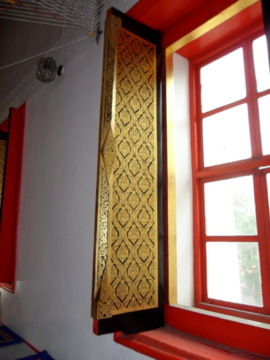 Here are some of the other attractive features in the buildings in Wat Mahapruettharam. Chofar is a horn-like structure protruding from the apex of the gable. These structures represent the Naga, the mythical serpent. 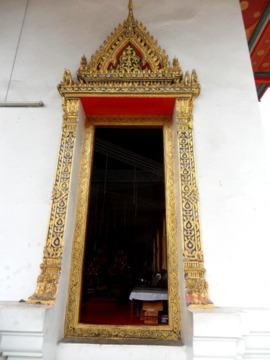 The doors and window panels of the ubosot and Viharn Luang Por Sukhothai are also worth noting. 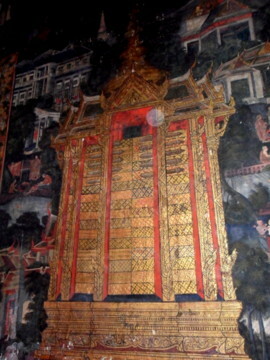 The Pho tree is where Buddha sat under during his Enlightenment. 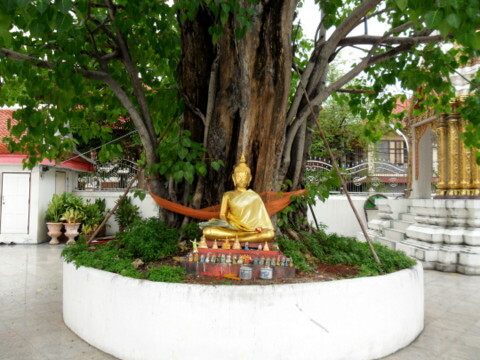 There is a Pho tree within the grounds of Wat Mahapruettharam. 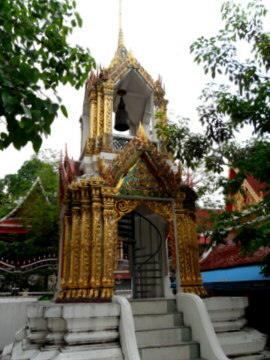 Of course there’s the traditional bell tower (hor rakhang). 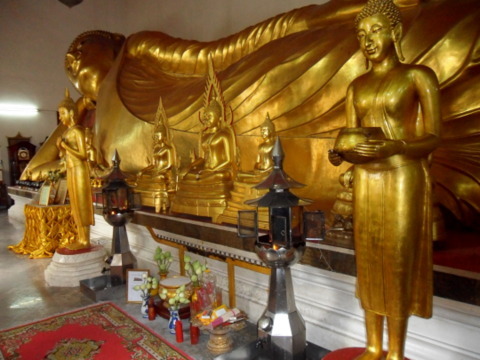 There were less than six visitors that morning during my visit to Wat Mahapruettharam. 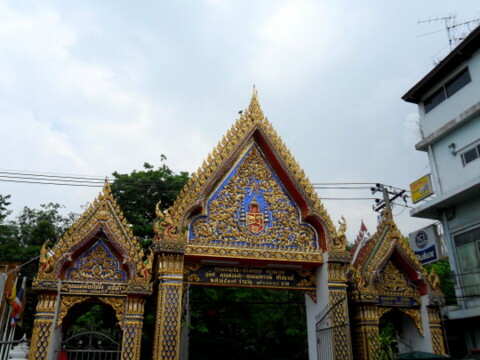 It’s a quiet temple that’s hardly mentioned in tourist guide books or web sites on Bangkok. You won’t get the hustle and bustle of crowds, street vendors, tuk tuk and taxis here. 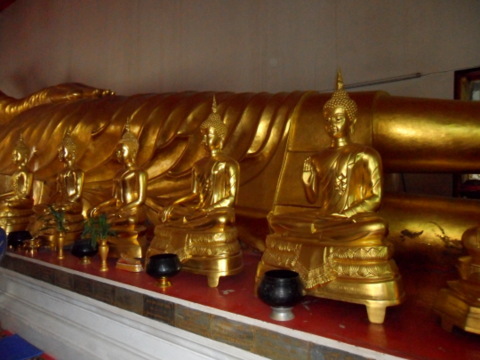 It’s a wonderful way to spend a peaceful morning admiring the beautiful murals, the golden reclining Buddha and other Buddha statues. Take a Chao Phraya river boat from the Sathorn pier that is below the Taksin skytrain station. Alight at the N3 Si Phraya pier near the River City Antique Centre. The walk to the temple is about 500 m.
If you are driving or taking a taxi, please note that Mahapruettharam Road is a one-way street. You’ll have to come by Rama IV Road. At the Hua Lamphong junction, turn left into Mahapruettharam Road. Continue on till you reach the temple on your left.